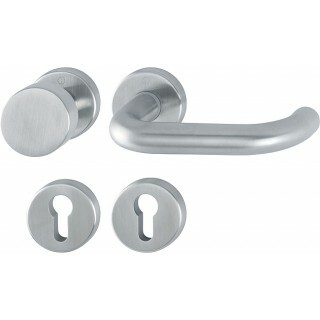 Handle with knob Hoppe for entrance doors Paris series on round rose with yale keyhole and antibacterial Secusan technology. Available with Sertos technology with 1 million cycles guaranteed. Paris series suitable for entrance house doors. 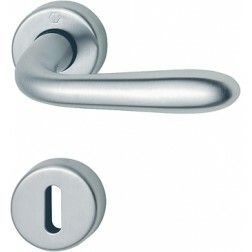 The handle to the inside of the house, and the knob to outside. All made in stainless steel, with a guarantee on the functionality up to 1 million cycles called Sertos technology by Hoppe. Additionally the surface is coated with an antibacterial repellent called Hopp Secusan (click and read more). Will be it shipped boxed with mounting kit included. Find out more of Secusan technology Hoppe!